A few years ago, Square-Enix, then SquareSoft, made a game for the PlayStation called Final Fantasy Tactics. It was a unique game, mainly because of its crisp graphics, good sound, involving story, and hours of engaging game play. This game was soon regarded as one of the best Final Fantasy games ever made, and it was also one of the first games to create a new RPG sub-genre. The sub-genre has given way to many games, some of the most notable of which include Fire Emblem, Tactics Ogre, and Advance Wars. Strategy-RPGs are games that involve tactical thinking, careful leveling up, and attention to the menus and details that other RPGs can?t adequately provide. They are much like fantasy chess in this regard: both games are turn-based, and they rely not on the strength of the characters, but the way you place a character. You see, a low level Archer can, plausibly, kill a high level Blue Mage; it?s just how the game is set up. Lovers of StarCraft and WarCraft are not likely to enjoy this game as much as, say, Civilization or Alpha Centauri fans might. It is a slow, methodical, and involving process, one that will likely captivate you and will pay off if you persist. Crisp and sharp, the graphics in FFTA are well done, and shown with barely a glitch or stutter. There was only one problem I had with glitches in this otherwise beautifully rendered game, and it happened twice in one day. At certain points, the game screen would blank, and a bunch of buzzes, whirrs, and pops would emit from the GBA SP?s speakers. While this only happened twice, it was certainly an inconvenience. So, make sure you save. The anime portraits of the characters are bright, colorful, and cartooney; the problem is that there are only a few different portraits, so that besides the main players, the rest of the characters and races only have a few portraits for their respective class. Spell effects and summons are generally very well done, especially with the summons. Some creatures, like the firey Ilfrit, are so well done, you might think that you are actually looking at a 2D PlayStation game. It?s that well done. Animation is pretty good, considering this is a turn-based game. All of the characters are constantly moving, and when they attack they move accordingly. When there is an in-game cut scene, the characters? heads turn and face the person they are speaking to. This may take a little getting used to, especially for players of RTS games. Basically, game play in Final Fantasy Tactics entails quite a few menu screens?okay, a lot of menu screens. Alright, the entire game is basically comprised of menu screens. 1) Enter a battle or choose a mission from the map of Ivalice. 2) Select your fighters. Look around the map to see what kind of enemies there are, and choose your fighters as you see fit. 3) Go into the Action menu. 4) Choose either Fight, Item, Battle Tech, or Combo. 5) Move your character. That?s pretty much it.It takes a little getting used to, but it is very much worth it once you get used to the game play. There is no voice acting in the game, but the sound is still extremely well done. It was surprising to hear such deep, adventurous, and rousing musical scores in a handheld game, but that is exactly what has been done. As always, Square-Enix does not fail to exceed expectations with great sound. The game?s battle sounds aren?t as good, but they aren?t below standard either. With the general clashes of sword, cling of armor, and cries of the knocked out, the sounds on the battle field are okay, but they only happen when characters are clashing?otherwise, it?s just the music playing, majestically. The controls are pretty good, considering that you only use the A button to speak of. Actually, that?s pretty much all you use, save for the times the control pad is used, or the times that you press the B button to cancel out of an action. Good controls overall. 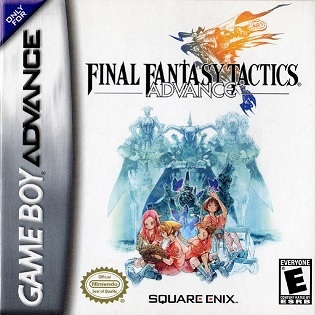 Okay, here?s where I have problems with Final Fantasy Tactics Advance. There?s no mention of demons, no mention of anything like that. But there is mention of ?crystals? which hold the world together. And an ?ancient magical tome,? which just so happens to turn the small country town of St. Ivalice into Ivalice, a world where there are multiple races. And battles. And judges. Yeah. Anyway, the other problem with FFTA is that there is a huge amount of usage of magic from several different types of ?mages.? There are the Black Mages, the White Mages, and the Blue Mages. Black Mages use Black Magic, White Mages use White Magic, and so on. Those are really the only problems with this game. I don?t like that the whole ?magic? thing has to be included, but I also know that some of you really don?t care about most of the content in games, save for the whole sexuality thing. If the inclusion of magic bothers you, don?t play this game. But underneath that, there is a long, quality game just waiting to be found.